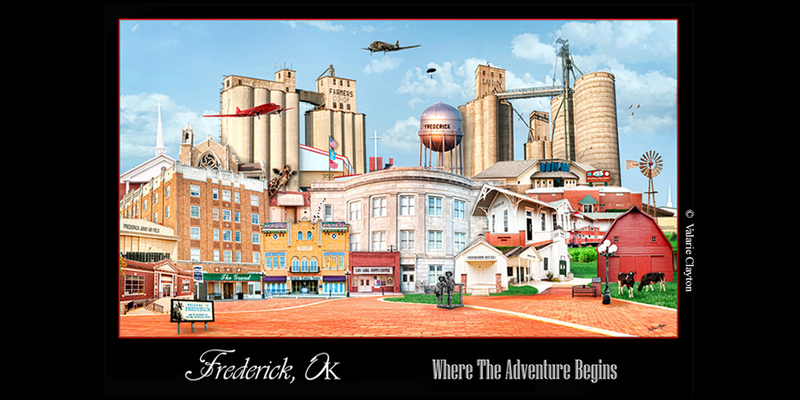 Frederick is already called home by many talented and successful musicians and artists. Jenny's work has been featured in Chicago, California, Washington D.C., Dallas and England. She will also be featured at the Governor's Gallery in the Oklahoma State Capital in 2015. Jenny Perry is our treasured local mosaic artist who owns a gallery at 114 N. Main. She gives art classes monthly and is always at an art show when she isn’t busy at the post office. from venues in Fort Worth to Oklahoma City, this band is fun, energetic and perfect for a Friday night. Clint Reid was born and raised in Frederick. He graduated and made a name for himself in Red River, New Mexico making T-shirts and doing Graphic Design. He has recently rejoined the community and quickly been put to work creating graphics for all things imaginable. George Jones and Little Big Town as well as sung at the National Anthem at Texas Motor Speedway. Frederick to New Mexico. He has recently ventured into the dashing detail of gourd painting. Looking for a band on the rise in the Red Dirt scene? Jackson Tillaman is the band for you! it up with Kevin Fowler, JB and The Moonshine Band & Jason Boland recently. great new things such as community collaging. She is the creator of the banner for this website. Oklahoma which has included Grammy-artist Brian White and Miss Devon from Toy Story 2. She has sang the national anthem for the OKC Thunder and performed at hundreds of venues. A graduate of Frederick High School, Sara found her calling in life through making jewelry. Her designs are beautifully unique and can be admired or purchased at KC’s Gift Shop in Frederick. Each piece is wonderfully hand made. She can instantly make you lose weight, have bigger hair or look more excited. Jennifer Grice does beautiful family portraits, senior pictures and everything in between. Under the name, Jen’s Pics, you can find her at her studio or online inspiring with her photography. In his spare time Quintin Kinder discovered that he was an artist at heart. He's been hammering bracelets out of materials such as copper, aluminum, stainless steel, brass then incorporating them with natural materials he's found on the ranch he and his wife Michelle own. Along with their daughter Mercedes, you can find Quintin and Michelle at local art venues and trade shows.